I have no idea why it’s so difficult to cook a perfect bag of microwave popcorn. My microwave has a one-touch popcorn setting that only pops about half a bag. And when I try adjusting the time manually, I wind up with a bag of charcoal. The secret, it seems, is to linger around the microwave to listen for the rapid popping to stop. That, too, is the secret behind appliance giant Whirlpool’s new AccuPop microwave tech on display here at CES 2014. It’s a simple idea that solves a real problem – AccuPop listens to your popcorn as it cooks, detecting when the popping slows down. 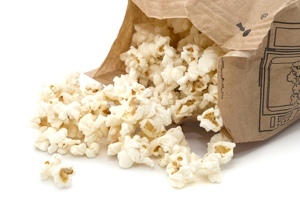 When it sounds like your bag is in the microwave popcorn sweet spot, AccuPop stops heating to prevent it from scorching. There is plenty of far-more fanciful kitchen tech here at CES, but a lot of it is largely conceptual. AccuPop actually solves a real problem. Hopefully, we’ll see it in use in even more microwaves in the future. Because let’s be honest: Most of us Americans use our microwaves almost exclusively for zapping bags of popcorn (and the occasional frozen burrito). Not that there's anything wrong with that. Whirlpool’s AccuPop tech will be available in higher end microwaves in February 2014. More details will be made available on the company’s website at whirlpool.com.